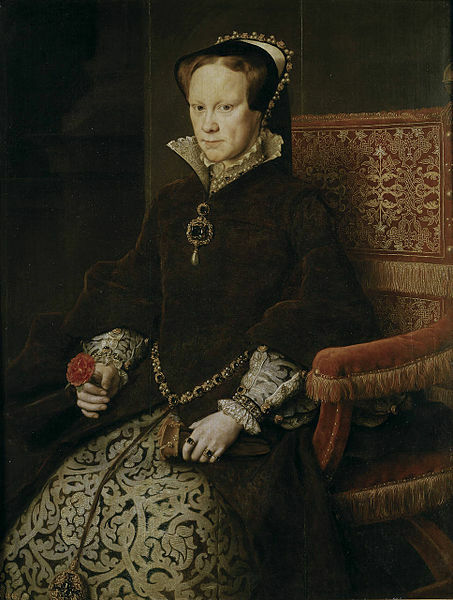 Today in 1553 Mary I was crowned Queen of England at Westminster Abbey by Stephen Gardiner, the Bishop of Winchester. It was a particularly important day in history because Mary was England’s first queen regnant, meaning she was the first queen to rule England in her own right. On the eve of her coronation Mary had left the Tower of London for her coronation procession, where she was escorted to the Palace of Westminster to prepare for the coronation. She was accompanied by earls, lords, gentlemen and ambassadors and had two carriages following her, one of which contained her half-sister Elizabeth and her former step-mother, Anne of Cleves. At 11am on the day of her coronation Mary processed into the Abbey in an open litter. The barons of the Cinque Ports carried a brocade canopy over her, exactly as they had done at her father’s coronation back in 1509. She was dressed in traditional crimson velvet robes, as a male monarch would be, and wore her hair loose. A queen consort traditionally wore white and gold for a coronation but as Mary was going to be ruling in her own right it was important that she be crowned more like a king to help emphasise her power and authority. Being the first queen regnant meant Mary had no precedent to follow either so she basically had to set her own standards. 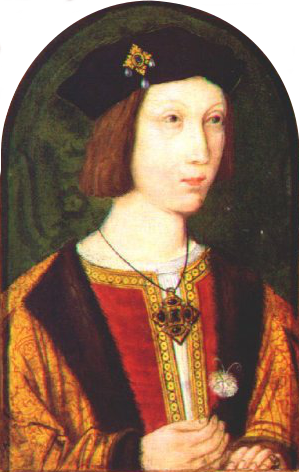 On 20th September 1486 Arthur, Prince of Wales was born at St Swithuns Priory in Winchester, the first child of Henry VII and Elizabeth of York. Elizabeth, the daughter of Edward IV, had become pregnant very quickly after marrying Henry VII in January 1486 and the pregnancy was widely celebrated throughout England. Henry had married Elizabeth to unite the houses of Lancaster and York after years of conflict during the Wars of the Roses so a baby was just what was needed to cement that union as well as strengthen the new dynasty that Henry had established. Henry was convinced the baby would be a boy and planned to name his new son Arthur after the legendary King Arthur of Camelot who Henry believed was his ancestor. Henry was convinced Arthur’s birth would herald in a new Golden Age for England like the one presided over by King Arthur and he wanted his son to follow in his footsteps. To further emphasise the point Henry also decided the birth should take place at Winchester which was widely believed to be the capital of King Arthur’s Camelot.